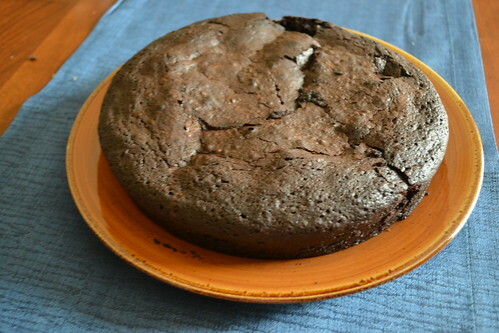 For our seders, I wanted a flourless, matzo-meal/cake meal free recipe for chocolate cake. I love chocolate. Here is the one I settled on because it was straight forward without any silliness of adding almond flour or cinnamon or espresso (all of which sounded great, I just really didn't have time). I didn't do the glaze, but I'm sure it would be fabulous! Here's my ONLY recommendation: FOLLOW THE DIRECTIONS! I didn't do the parchment paper on the bottom and both cakes I made (one for seder and one for the next two final days of Passover) broke in half because a portion stuck to the bottom of my pan (I'm not lucky enough to have a springform pan for Passover... or I'm too cheap/frugal/thrifty). I'm definitely making this cake again after Passover, though I'd like to try it with Earth Balance or Imperial Margarine rather than the K for P stuff. 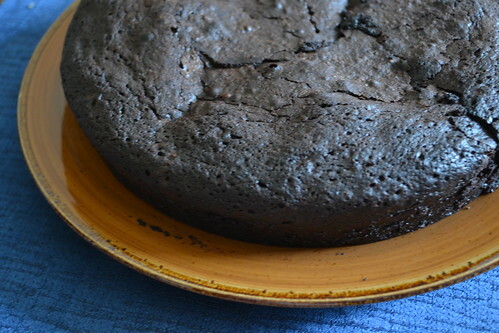 It's so rich and fudgy and great with berries of any kind!